This needs to be on a T-shirt YESTERDAY. I just checked the store and it isn’t a shirt yet. *Sigh* Looks like I’m going to have to check back every hour until it is. Chris, if you ever put this on a teeshirt, Boog’s variation needs to be an option as well. That’s why I’m not getting enough sleep. Life is amazing. 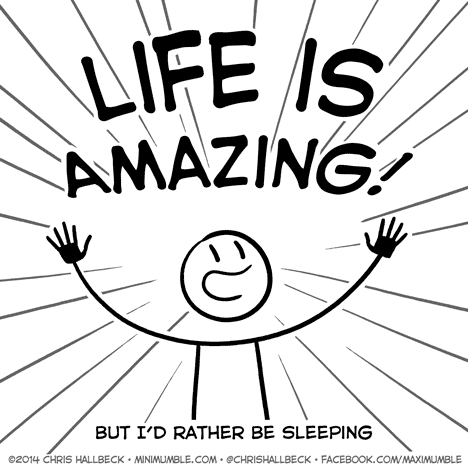 In fact, you’re amazing and keeping me up right now. I have to agree; this needs to be on a shirt. I too need this on a T-shirt! It has been a few years, so I am going to bump and reinforce that this needs to be a T-shirt. I will order one if I ever see it.